I know, a lot of you are interested in following a low-carb diet. Obviously meat is a good solution to add good protein and fat to your diet without the nasty carbs. But you might have recognized that there are some studies which found out that, for several reasons, it could be bad for your health if you eat too much meat (e.g. traces of medicine in the meat, cholesterol, acidaemia and so on). Now you can believe in that findings or not, though it won't be a disadvantage if you substitute some of the meat with soy products (high in protein, low in carbs) to be on the safe side. Some other reasons for using vegetable protein could be that you are a vegetarian or just don't want to spend that much money for high-quality beef/pork. Different reasons same point...you need some possibilities to replace meat with another source of protein instead (like soy). I personally really enjoy the taste of fresh high-quality meat but I try to eat it only 3-4 days per week while I substitute it with vegetable alternatives on the other days (I believe in a happy medium). 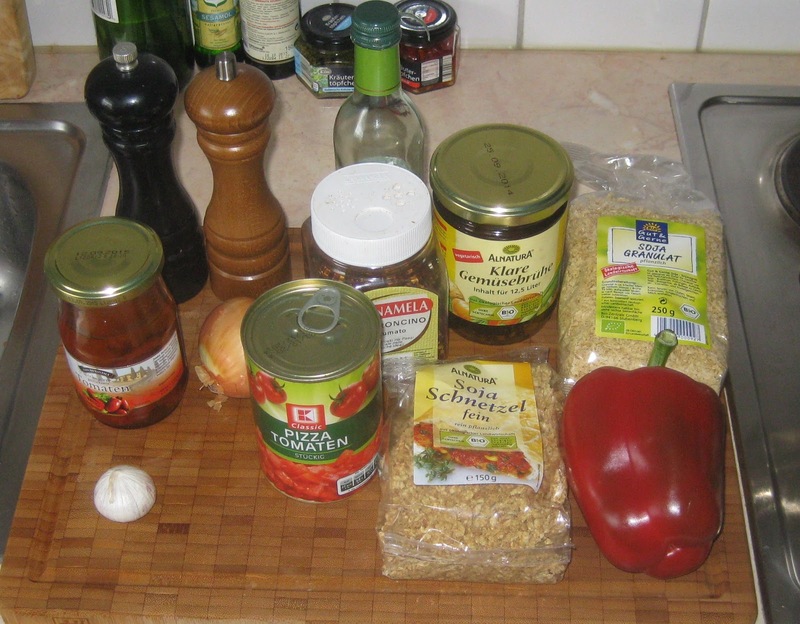 So, today I'm gonna provide an easy recipe for a delicious alternative to chili con carne...the chili con soja! Chop the onion and garlic to small pieces and cut the pepper in squares. Heat the olive oil in a saucepan and fry the onion and garlic for a few minutes. Meanwhile take a measuring jug, put in the soya granules and pour in the hot vegetable stock (leave it like that for some minutes). Put the pepper into the saucepan and sauté them for 5 minutes. Now add the content of the measuring jug (soya granules and vegetable stock). Cook it for 5 minutes. During this time use an electric chopper to chop the dried tomatoes. Add the dried tomato pieces, a dash of wine and the chopped tomatoes (from the can) to the saucepan. Now boil the whole for 10 minutes and stir it from time to time. Add some (not too much!) chili powder(or dried chilies), the smoked paprika, the italian herbs and some salt and pepper to taste. Let it boil with low-heat for 15 more minutes. If you try it, I'd love to hear how you liked it!